This is the behind-the-scenes story of Noel's biggest ever world tour with his band The High Flying Birds and the making of his critically-acclaimed album Who Built The Moon? 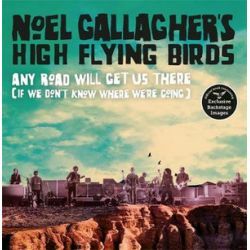 Noel has had a momentous year, with his third number one solo album, a Mercury Prize nomination and a 72-date tour across the globe, and this book documents every step of the journey. Through the lens of former official Man City photographer Sharon Latham, who was granted unprecedented access, this is Noel Gallagher as you've never seen him before. Curated by the man himself, the book contains hundreds of unseen, stunning shots from both on- and off-stage that take the reader right across the USA, Canada, UK & Ireland, Europe, and Southeast Asia, alongside candid interviews and anecdotes from Noel as well as contributions from his band and crew. A must-have book for fans who want to join one of music's greatest heroes through one of the most memorable moments of his life. Produkt został dodany 07.12.2018 03:03. Ostatnia zmiana danych produktu miała miejsce 07.12.2018 03:03.